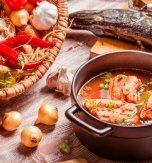 The Ukrainian cuisine is famous for the diversity of meat dishes. 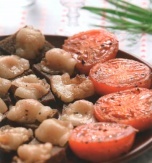 Ukrainian people like to cook and eat meat and one of the most popular dishes are kruchenyky. 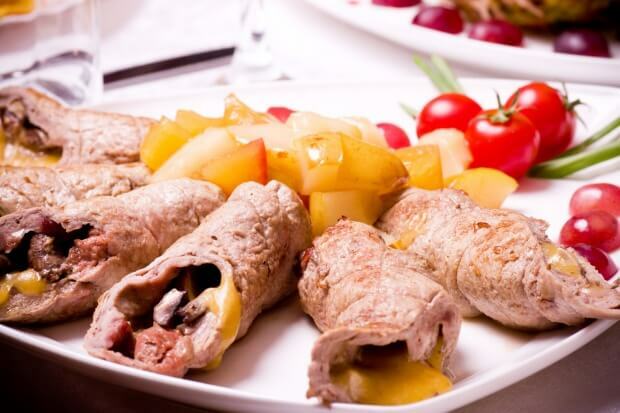 Kruchenyky are meat rolls which can have various filling beginning from vegetables and finishing with dried fruits. 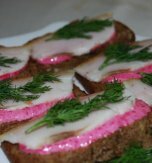 Today we will cook chicken kruchenyky with tender cheese and salo filling. They are small enough to enjoy in four bites. However you’ll be able to feel and distinguish every single component in the stuffing. These savory and comforting meat rolls will become a great appetizer that is sure to please. Wash chicken thoroughly and dry it. Cut the meat into long strips and beat them. Rub the chicken with the mix of salt, red ground pepper, and black ground pepper. Chop salo finely. Grate the hard cheese. Combine the ingredients and add sour cream and melted dairy butter. Stir everything carefully. Arrange the prepared filling above the chicken strips. Starting at the one end, tightly roll up each chicken strip. Fix the rolls with the help of toothpicks. 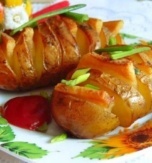 Peel and dice potatoes. Cover a baking tray with foil and arrange the potato with pork rolls there. Bake the ingredients for 40-45 minutes at 175–180°C (347-356°C). Remove the toothpicks and serve the dish. Do you have a favorite Ukrainian recipe for chicken rolls? If so, please let us know in the comments below or write us an e-mail.